Waiʻaleʻale (or 'Rippling Waters') Lake, the namesake of Mount Waiʻaleʻale. 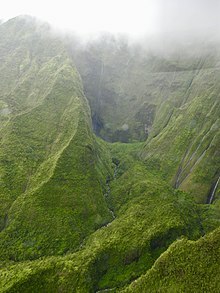 The summit of Waiʻaleʻale features a tropical rainforest climate ( Köppen Af), with substantial rainfall throughout the course of the year. ( Bodin 1978: 272) quotes 460.0 inches (11,684 mm) per year figure as being the 1912–45 average, an average that quite possibly will have changed since then, while The National Climatic Data Center quotes this figure as a 30-year average. The Weather Network and The Guinness Book of Weather Records ( Holford 1977: 240) quotes 451.0 inches (11,455 mm) rain per year, while ( Ahrens 2000: 528) quotes 460 inches (11,680 mm) as the average annual rainfall at Mount Waialeale and ( Kroll 1995: 188) claims 510 inches (13,000 mm) falls here. Similarly, The Weather Network and the Guinness Book of Weather Records quote 335 days with rain here while ( Simons 1996: 303) suggests that rain falls on 360 days per year. The local tourist industry of Kauai has promoted it as the wettest spot, although the 38-year average at Mawsynram, Meghalaya, India is higher at 467.4 inches (11,870 mm). Both Mawsynram and Cherrapunji in Meghalaya are recognized by the Guinness Book of World Records as having higher average rainfall. Mawsynram's rainfall is concentrated in the monsoon season, while the rain at Waiʻaleʻale is more evenly distributed through the year. Its peak lies just below the so-called trade wind inversion layer of 6,000 feet (1,800 m), above which trade-wind-produced clouds cannot rise. And most importantly, the steep cliffs cause the moisture-laden air to rise rapidly – over 3,000 feet (910 m) in less than 0.5 miles (0.80 km) – and drop a large portion of its rain in one spot, as opposed to spreading the rain out over a larger area if the slope were more gradual. The great rainfall in the area produces the Alakaʻi Wilderness Preserve, a large boggy area that is home to many rare plants. The ground is so wet that although trails exist, access by foot to the Waiʻaleʻale area is extremely difficult. ^ ( Pukui, Elbert & Mookini 1974: 220). ^ "'Big Bog' ranks among wettest spots in Hawaii, possibly world - Mauinews.com | News, Sports, Jobs, Visitors Information - The Maui News". 2016-09-28. Retrieved 2018-08-30. ^ "Global Measured Extremes of Temperature and Precipitation". National Climatic Data Center. August 9, 2004. ^ "Mount Waialeale – Climate Summary". National Oceanic and Atmospheric Administration. Retrieved August 21, 2010. 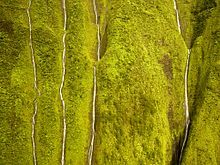 ^ "Climate Data for Mount Waialeale, Hawaii". Weatherbase. Retrieved November 18, 2011. ^ USFWS. Determination of endangered status for 48 species on Kauai and designation of critical habitat; Final rule. Federal Register April 13, 2010. Pukui, Mary Kawena; Elbert, Samuel H.; Mookini, Esther T. (1974). Place names of Hawaii (2nd ed.). University of Hawaii Press. ISBN 978-0-8248-0524-1. Site with hiking info on routes to Waialeale and Kawaikini and summit photos.